After more than 20 years of introducing folks in Pensacola to their Cajun specialties, Cory and Carl Broussard have landed in Navarre Beach. Broussard’s Bayou Grill and Cajun Market opened in October 2017 just over the Navarre bridge and not far from the fishing pier. It has six times more dining space than its sister restaurant to the west. 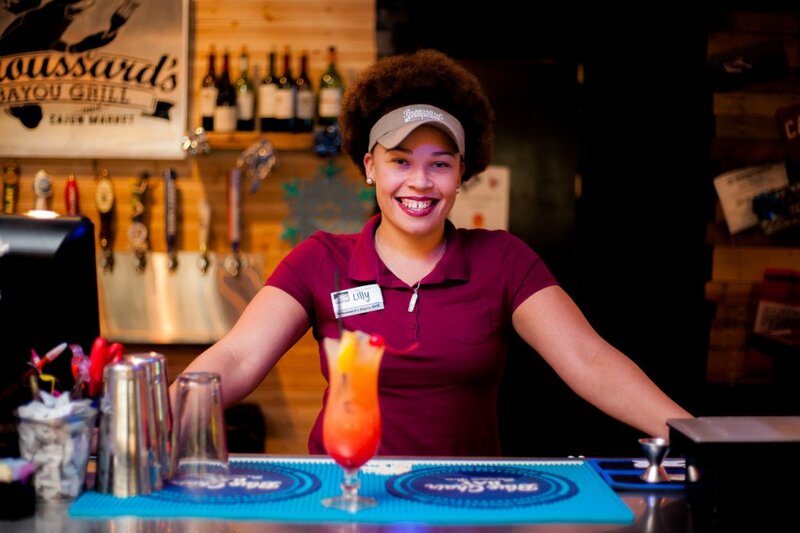 During its debut period, Broussard’s bartenders got together to create a signature drink for the establishment. Just how popular is it? “We sell a couple hundred a week during the summer season,” Fanion said without hesitation. Andy DeMartin was in charge of the bar when Broussard’s opened. He has since become director of sales for the restaurant’s parent company, Cajun Specialty Meats, Inc.
DeMartin confirmed Fanion’s estimate of just how well the Cajun Luau can sell during peak periods. Regular customers quickly made Cajun Luau a favorite, according to DeMartin. Floor manager Samantha Baggett just smiled when asked about the Cajun Luau. “It’s our top seller, especially on the weekends,” bartender Lilly Markovitz said. Top with ¼ ounce Grenadine. Do not shake or stir, and garnish with orange slice and cherry.